Ok, so what could have been done with these tricky windows? Use any type of cornice or valance on all 3 windows, all installed at the same height off the ground (approx. 15” above the 2 windows, and wherever that is above the slider). The bottom of the valances will come into the window molding concealing that the windows and door start at different heights but not lower than the “walk through height” of the door. 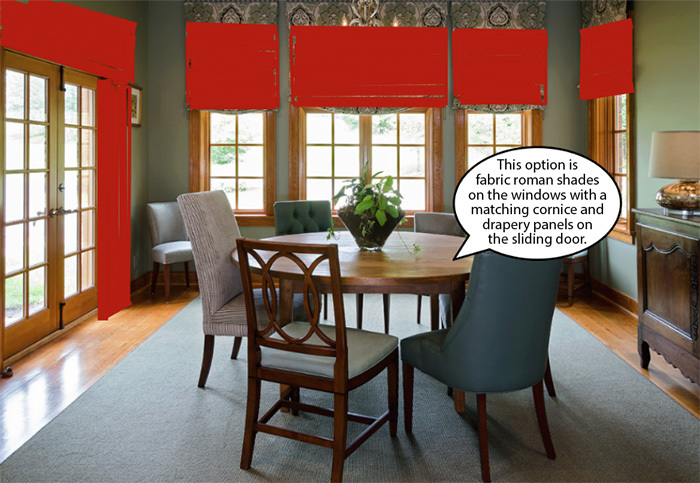 Then install roller shades or Hunter Douglas Duette shades under the top treatments to use when privacy or light control is needed. This solution is not as finished feeling as the others as you will see and is not my favorite but it still would have better proportion than the existing solution and achieve the effect of unifying the windows and door. On the windows install the same style roman shades, again install at approx 15” + – above the window frame, rather than to ceiling. This install point still raises the eye, still allows for window clearance but also allows us to use an upholstered cornice on the slider, mounted at the same height from the floor. As above, the bottom will not go lower than the walk through height of the door. Then, for a bit more punch, we add 2 side stationary side panels under the cornice on the door only. We make the cornice wider than the frame by at least 12” on each side so the panels frame the sliding door without blocking any light or view. This solution best keeps the feeling the designer seemed to be going for while eliminating the awkward, screaming, unfinished sliding door. Leaving that door unaddressed is like putting on a great dress and throwing on Converse high tops. What’s the point of the beautiful romans if they only make the room feel awkward? On the windows install fully operable woven wood roman shades, in a neutral color similar to the window frames, again at about 15” above the frame. Then we add drapery rods just above those with a pair of stationary panels made from the patterned fabric. On the slider we do the same thing however, because we don’t need privacy or light control on the door, we use a “mock” woven wood roman shade. This means we order the woven wood only 24”-30” long instead of full door length and it is permanently pulled up to the walk through height of the door. This way we get 2 or 3 folds at the bottom of the roman giving the illusion that it is a full shade pulled up and we save money by not ordering a full length shade that we have no need for. As in above, all the rods are wider than the frames by at least 8”-12” on each side. This enables us to have the drapery panels on the wall and window frames, keeping the glass exposed for maximum light and view. I like this solution the best because we can see that it is a big room and I think it can take the added fullness the panels bring. And since it is a dining room it can afford to be dressed up without seeming too over the top.